My pet project web series THE OUTSIDE MAN isn’t really “my” project in any true sense. It’s really very much a collaboration between several dozen artists of varying mediums. Today I’d like to talk about some of the physical preparation, and how a revolutionary flexibility program I lucked upon has put me on the path to exceeding even my lofty expectations. For the early stages of my training, I realized I had to change things up. Having worked as a trainer and coach for mixed martial arts competitors for a few years, I had gotten into the habit of training myself as well as the fighters in terms of efficiency of movement -the most power or damage done while expending the least amount of energy, and simultaneously taking the least amount of damage upon oneself, within the confines of MMA rules. 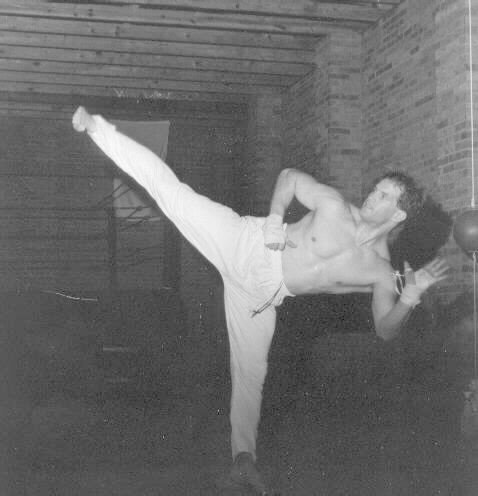 With the concept of THE OUTSIDE MAN percolating in my solid-metal brainpan, I thought of my previous experience with the world of fight choreography on various sets, attending stunt fighting schools with luminaries like Cynthia Rothrock, Joe Hess, Eric Lee and Michael DePasquale Jr., and the countless hours of fight films I had watched. I have worked on numerous films where shortcuts were taken, both in terms of safety and aesthetics in the fight scenes and I dearly wanted to avoid having that happen in OM. And it had to start with me. Flexibility training has changed a lot over the years, and having a few injuries from fighting and training, I had developed a few weak spots. I really needed an edge in my stretch routines that would bring me back up to speed so I did searches for splits, kicking higher, etc. Amid the many tried (and mostly true) programs available, the work of Paul Zaichik and his Elastic Steel system caught my attention for its emphasis on safe and thoroughly scientifically researched flexibility enhancement. When one thinks about making goals for gaining flexibility, in terms of martial arts at least, there’s an unfortunate tendency to become myopic. Many martial artists try to achieve the splits position for instance, as a goal itself rather than a means to an end. And while it’s very helpful to be able to do splits, it doesn’t, as I learned the hard way, instantly grant you flawless technique, balance, or muscle control. Turns out it’s actually easier to improve in all those areas by simply understanding how and why the muscles work for and against each other, and what you can do to train them efficiently. Zaichik has studied -and continues to study- these elements extensively, and has made his knowledge accessible and easy to understand. I only wish I’d had some of this information when I started training, but I’m stoked that I was able to implement it now. At any rate, he’s easy enough to find via ElasticSteel.com and on youtube, where one can find scores of helpful tutorials. It’s just fun to watch him demonstrate kicks as well, as he can perform just about any technique with power and speed. I’d be remiss if I didn’t point out that Paul’s research and teaching isn’t limited to martial arts. He has devised sport specific routines for baseball, yoga, dance, running, rock climbing and probably just about everything else. I’m currently using an intermediate hamstrings program, which I’ve been on for a couple of weeks. The striking thing about this method is that it’s almost the opposite of what I had come to expect as a martial artist, in terms of rigor and time spent. The routines don’t take long and aren’t overly taxing or painful; just very very efficient. For the series, that translates to maximal fight scene badassery and minimal danger to the participants, like it oughta be. Next time you’ll meet the psychos behind the camera.